And the winners are.... @THGbeauties & @foreverlarkkp! Thanks to everyone who entered. Stay tuned for more giveaways from TheHungerGamers.net in the future. Planning on going to the 8:00 p.m. Thursday premiere of The Hunger Games: Mockingjay Part 1 in less than two weeks and still don't have a new Hunger Games outfit to wear? Well, the odds are certainly in your favor! 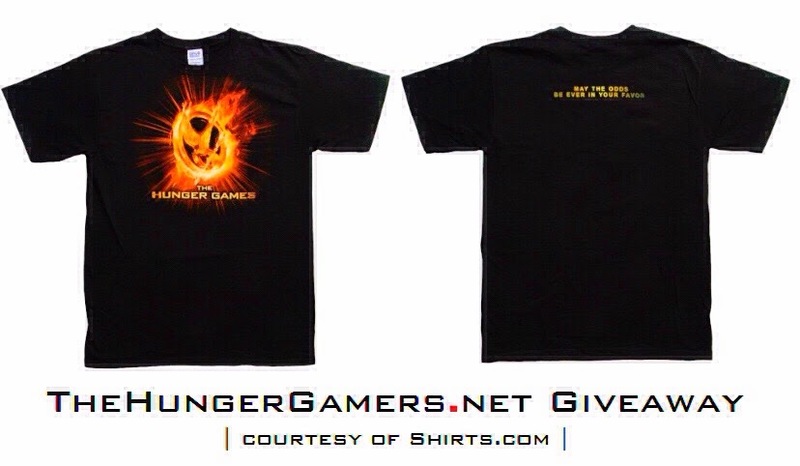 TheHungerGamers.net is giving away two awesome Hunger Games shirts in partnership with Shirts.com! This is in celebration of the forthcoming theatrical release of the first film in the two-part finale of The Hunger Games film series and in thanks for the outpouring love and support that you have been giving us since TheHungerGamers.net's launch three years ago (we also just hit the 50,000 follower mark on Twitter recently). This giveaway contest is open to all our readers worldwide. Check out more awesome Hunger Games shirts at shirts.com! First, make sure that you are following us on Twitter @TheHungerGamers. We will be posting this same exact message on Twitter FOUR times everyday around 5:00 p.m. CT starting from today, November 8th, through Tuesday, November 11th. The more times you retweet the daily giveaway tweets, the more entries you make and the better your chances of winning! The winner will be chosen on Wednesday night, November 12th through random.org. First, we will generate a random number from 1-4 through the online random number generator to select which of the FOUR tweets (Saturday, Sunday, Monday or Tuesday) we'll choose the winner from. Then finally, we'll generate another random number to pick which of our followers who retweeted that particular tweet wins. What are the three most significant lessons that you have learned from Suzanne Collins' The Hunger Games Trilogy (or from the films)? IMPORTANT: Please include your Twitter Address (ex. @TheHungerGamers) in your answer. If you do not have a Twitter account, please provide an email address when signing in as a guest to post a comment. The winner will also be chosen through random.org on Wednesday night, November 12th. We will announce the two winners on Thursday, November 13th at 12:00 p.m. CT on Twitter. Winners will be contacted through Twitter Direct Message (or email). That is why it is important that you include your Twitter Address along with your answers in the comments if you are entering the contest through Method 2. Lastly, please make sure that you are following us on Twitter so we can contact you through DM if you win. Good luck Tributes, and may the odds be ever in your favor!